These POSH Mini Dog Tags are just the cutest wee pendants! Wear your whole family in a very chic way! The tags are 10mmx16mm and a sturdy, strong 1.3mm thick. 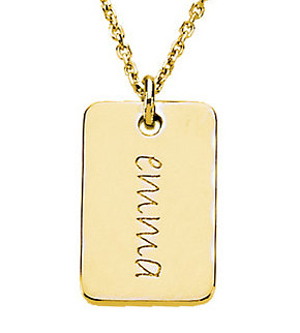 Choose from sterling silver, 14k yellow or 14k white gold and then simply personalise with a name or date. A second name or date is able to be engraved on the back for a small additional charge. Your stunning POSH Mother Jewellery not only comes gift-boxed, but with it's own polishing cloth to keep it looking gorgeous!